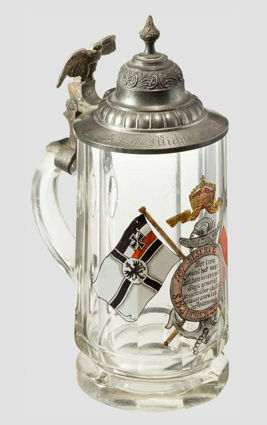 Half-liter glass stein, facet cut, dedicated to Obermatrose (Seaman First Class) Michels. 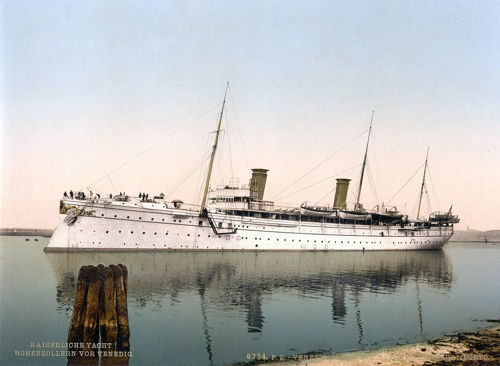 Crossed flags and crowned anchor with medallion on the front side and inscription "1897 - Reserve - 1900 - S.M.J. Hohenzollern" Pewter lid with engraved name, thumblift in the form of an eagle. Height 22.5 cm. Rare and beautiful stein. The title on this auction listing indicates that Obermatrose Michels was a member of the 2nd Company of the 2nd Coastal Artillery in Wilhemlshaven. 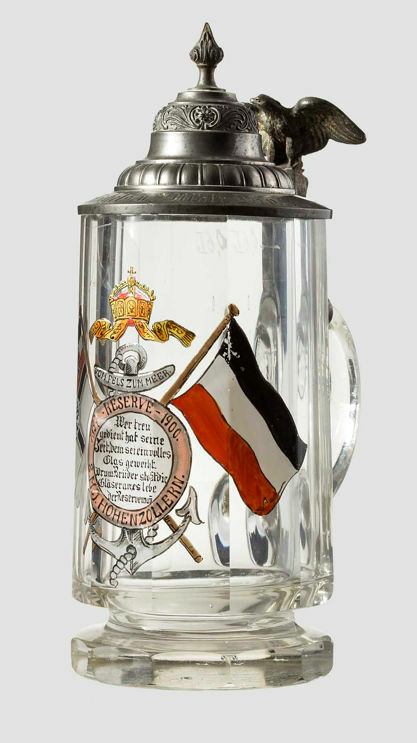 The enameled flags are the War Ensign (on the left) and the flag of the German Imperial Empire on the right. The outer ring of the "medallion" between the flags reads "1897 - RESERVE 1900, S.M.J. HOHENZOLLERN." referring to the Kaiser's yacht. No dingy this, the yacht was 390 feet long! Since Michels was a member of a coastal artillery unit, he would not have served aboard the yacht, and since the decoration on the body does not refer to any specific military unit, we can assume that this stein was produced as a generic naval tribute, to be personalized by the purchaser by engraving the lid. Wer true gedient hat seine Zeit, dem sei ein volles Glas gewerht. Drum Brüder stosst die Gläser an, es lebe der Reservemann. Those who have served their time well have been given a full glass. Brothers, rattle your glasses, long live the reservist. The first part of that translation is straightforward, but the word "Drum" in the second part is more difficult. In making an interpretation I have relied upon a student drinking traddition of toasting in which a group moves their glass or stein in a circular rattling motion on a table top before all simultaneously drink a toast. Click here to view a pictorial index of all Featured Stein articles.